We tend to remember and take comfort in those memories of warm family dinners, where we are surrounded by our favorite people sharing delicious food, some laughs and warm hugs. Contributing to this family scene is the dining room set you rely on. 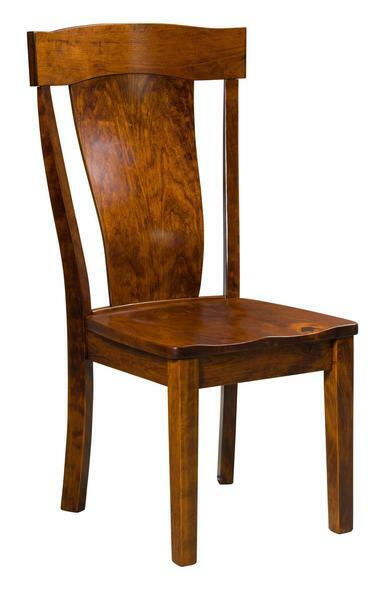 Let the Amish Woodmont Dining Chairs become part of those cherished memories as they offer supportive and comfortable solid wood furniture that the entire family will enjoy. The Woodmont is a sight to behold, with a sculpted central back splat that is waiting to hold you comfortably. The shapes of the Woodmont are positively contemporary with strong and attractive natural wood handcrafted beautifully. Be sure to view the Amish Woodmont Single Pedestal Table to create a dining room the whole family will flock to.